It is with profound sadness that we announce the peaceful passing of Derek Arnold Merry, age 80, of Cheticamp, surrounded by his family in the Sacred Heart Community Health Centre after a brief illness. Loving husband to Georgina (Diddee), Dad to his 4 children, Papa and Grampa to his 10 grandchildren and 5 great-grandchildren, Uncle Derek to his many nieces and nephews, and Daddy to his daschund Heidi, Derek’s devotion to his family was evident in all that he did, as was his love for his community, which he served with great pride. 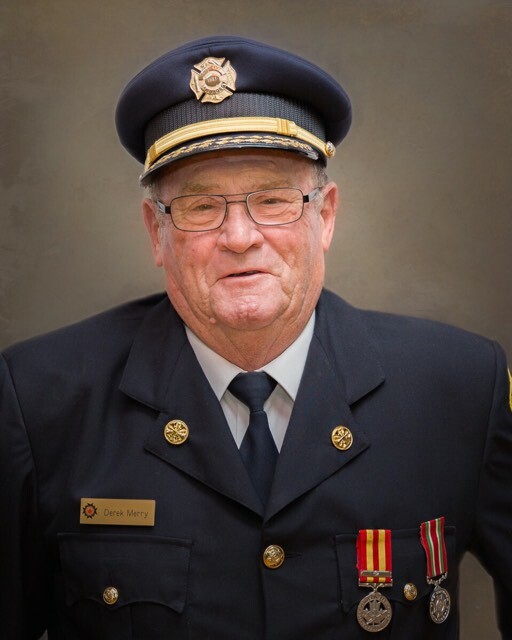 He gave 38 years to the Cheticamp Volunteer Fire Department, making him their longest-serving member. After his family, he regarded this as his greatest accomplishment. His community involvement did not stop at the fire hall. He was also a founding member of the Cheticamp Search & Rescue and the Highland Snowmobile Club, a board member of the EMO Committee, and of GAMS. He worked in the fishing industry for 47 years, starting first in 1972 with EP Melanson, then HB Nickerson, Paturel Seafoods, the Barry Group, and finally with his dear friend Hector MacKinnon of Ballast Ground Fisheries. He was also a member and vice-president for 28 years of the Cheticamp Fisheries Monitoring System. Prior to entering the fishing industry as a buyer, he owned and operated his own Esso service station. After becoming a licensed mechanic in 1958, he married the love of his life in 1960 and spent his entire life in Cheticamp. He loved to snowmobile and was recognized by Bombardier as one of its longest owners and riders with over 53 years on the trails. He was the first Bombardier dealer in Inverness County when he began selling the machines in 1966. Derek was a pillar of the community as well as of our family. He was never one to turn away a person in need, and in the last weeks of his life, we were grateful and amazed to hear others’ tales of how Derek helped them, whether it was with employment on the wharf or at the gas station, a lift in a snowstorm, a place to stay, or by telling stories of others who had passed before him, keeping their memories alive. Never one to leave a good story unembellished, Derek had as many stories as he had buddies — at least one for every place he ever visited — and loved to share his wisdom about cars, the weather, and life, with any and all. He taught us how to drink good whisky and beer, change a tire, to put ourselves in the service of others, and to live life with humour and dignity. He was predeceased by his parents Helier and Nellie, brothers Harold and Winston, in-laws Joseph and Malvina Maillet, son-in-law Steve Williams and niece Debbie. He will be forever remembered by his wife of 59 years Georgina (née Maillet), his sons Dale in Cornerbrook, NFLD and Darren (Lynne) in Bridgewater, his daughters Brenda Williams in Reno, Nevada and Shelly Merry-Aucoin (Réné) in Cheticamp, his grandchildren Lindsey (Chris), Colin, Natasha, Joseph, Karolyn, Jaymee, Derrica, Rachelle, Riley and Eoin, and 5 great-grandchildren, his sisters Helen in Stellarton and Gloria di Blasio (Pat) in Montreal, his brother Franklin (Ethel) in Cheticamp, and special niece and nephew Shunda and Eoin MacInnis, as well as many other nieces, nephews, grand-nieces and grand-nephews, and extended family members all over the world. The beginning of his life was marked by being the first baby born in the Sacred Heart Hospital in Cheticamp, and the end of his life was made ever more dignified by the loving care he received from the doctors and nurses (his ‘morning angels’) at the Sacred Heart Community Health Center and his palliative care team of Dr. Ritter and nurses Paulette and Diane. His family owe them all a debt of gratitude that cannot be quantified. A visitation will be held Tuesday, March 26th, at the Chéticamp Funeral Home from 2 to 4pm and 7 to 9pm. A memorial service will take place Wednesday, March 27th, at 10:30am, in Église Saint-Pierre in Cheticamp, with Fr. Peter LeBlanc and Rev. Maggie Plant officiating with burial taking place at Saint Andrew’s United Church cemetery in Pleasant Bay at a later date. In lieu of flowers, memorial donations may be made to Saint Andrew’s United Church, the Nova Scotia SPCA, or the Sacred Heart Palliative Care Society. I share your sorrow at this sad time on the loss of our dear Derek, a gentleman in every sense of the word and model citizen of the community. I recall the few occasions we had to meet and I was always impressed by his respectful reception and genuine caring. I pray that we shall all be sustained by our happy memories of him and that we’ll forever appreciate his legacy to all of us. ‘God bless you and the family in these difficult times. and a friend ever since. Honey and I send all of you our deepest Sympathy. I’ll miss you Derek on my visits to Cheticamp. Our sincère sympathies to all family members of Derek. You are in our thoughts and prayers at this time and following your great loss. As I am not very mobile ,I will not be able to attend his services. Sincere condolences on the loss of your Dad. His obituary in the Chronicle Herald was a special tribute and while I know you will miss him very much, it appears there’s a lot of others who will miss him too. He sounds like he was a very important thread in the fabric of life in Cheticamp. Best wishes from Wade and me. To our dear Cape Breton family, Shelly, Réné, Karolyn and Rachelle. We are so,so saddened to hear of Derek’s passing. He and Diddee welcomed me into their home from the first time I visited Cheticamp, and I will hold dear the memories of my many visits there. Our deapest condolences to Diddee and all the family. We wish we could be there with you this week, but we will be sending you lots of love from PEI. Farewell to a friend, a great neighbour and a life well lived. Everyone is going to miss you. To the Merry Family, Relatives and Friends. I was not privelidged to have met Derek but I have heard lovely comments and stories of this very special person. Another bright and shining star is now in our heavens watching over his loved ones, always there to remind you that his love for you shines on forever and a day , watching over each and every one he has encountered while on his stay on this earth. He will be waiting for you at the pearly gates when it is your turn to meet the Ferryman who will fly you across the starry ocean to reach the other side. May you each and everyone feel the warm embraces and love from God, Our Creator … always with you in the bleakness of sorrow and in the joyous brightness of happiness, joy and wonderful memories you hold within your hearts. May you feel God’s Blessing always in your hearts. So sorry to hear of Derek’s passing. I have many fond memories of your times in Corner Brook and my visits to Cheticamp. He was a jolly happy soul! A very strong good man. My thoughts are with you all. Our thoughts and prayers are with you during this difficult times. I remember him from our “boy scouts Days” and grade 10 school. His leaderchip and management qualities were always above average. DEAR DIDDEE,DALE,DARREN, BRENDA,SHELLY & FAMILIES,MAY ALLTHE HAPPY MEMORIES OF TIMES SPENT WITH DEREK CONSOLE YOU ALL AT THIS MOST DIFFICULT TIME AND FOR MANY YEARS TO COME.MUmu0UR THOUGHTS & OUR PRAYES ARE WITH THE WHOLE FAMILY. SINCERELY, MURIEL BLACKWOOD AND FAMILY. Georgina and Family,So sorry to hear of Derek ‘s passing.We hope your fond memories of him will take you through this journey.Prayers and condolences to all of you. Sorry to learn of your dad’s passing. May it comfort you to know that the thoughts and prayers of many friends, are with you during this most difficult time. Sincere condolences to all of Derek’s family. He was a nice man and lived a good life. RIP Derek. Regards Nicolle à Francois. Our thoughts are with you all during this difficult time. He was loved and thought so well of by his community. One of Cheticamp’s finest has left us. Such sad news to read. Derek was a good man who will be missed by so many. Our deepest sympathies to Diddee and all the family. My God’s arms hold you close and comfort your family with your father’s passing. He always had a story to tell and was so proud of his family. He will be sadly missed.